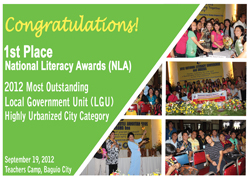 Davao was awarded as the Most Outstanding Local Government Unit under the highly Urbanized City Category of the National Literacy Awards in 2008, 2010 and 2012. The portfolio submitted by Davao City embodies sixty eight (68) programs implemented by the City Government of Davao in coordination with various sectors of the society. Please see Annex A for complete list. During the national validation, the projects/offices visited were: City Civil Registrar’s Office, One Stop Shop of the Business Bureau, OSCA, Public Safety Command Center, Central 911, Matina Aplaya – Mangrove Reforestation, Rehabilitation and Protection Program, Alima DEVS Center,Co Su Gian Home for the Aged, Barangay Sasa-Barangay Literacy Program. Category for the 2012 National Literacy Awards.